Dopapod's return to Philly this weekend brought some old favorites and new songs, a few fun covers, and a couple sit-ins from special guests. Their visit here was also marked by the release of their newest live album, II Saw Live Dopapod Evil Was II, which released Friday, March 31st. Philadelphia is basically Dopapod's 2nd home in a way, family and friends came out for the show and we even caught sighting of and spoke with several local Philly bands in the house at the TLA. Ten years into the game, Dopapod has forged a spot in the music community as a powerhouse act that we personally have never seen disappoint. ​Dopapod has new songs slipping out of their sleeves lately, and performed the new ones Confabulation and Mucho(Video below) on night one, which had Compa and Winderman singing lines in Spanish to a very catchy melody. On Friday night we also got a taste of some favorites like Bubble Brain, Like A Ball, French Bowling, and Weird Charlie - staple 'classics' at this point in the Dopa-catalog. The quartet was also joined Friday night by drummer Russ Lawton and keyboardist Ray Paczkowski of Soule Monde for the keyboard-heavy Off The Cuff. Also doing a familiar cover, the band dove into Aerials by System of A Down which seemed to light some fans up in the audience. 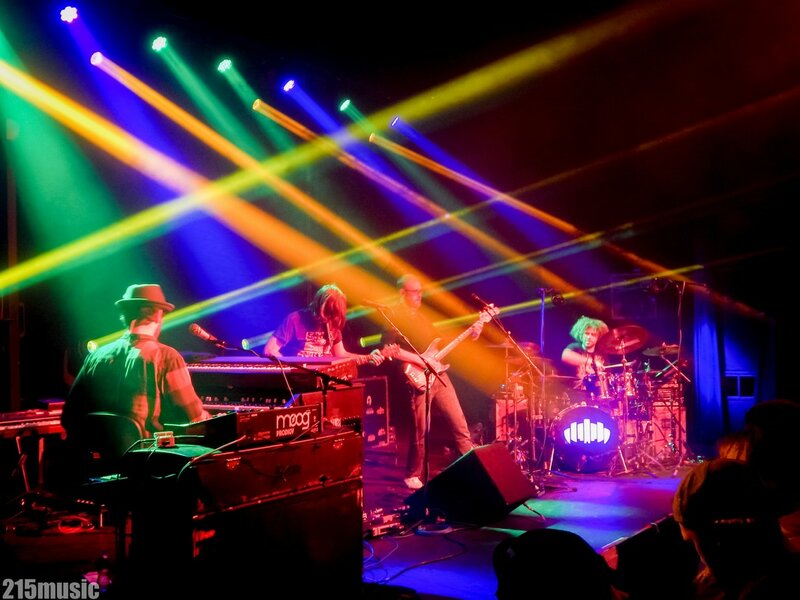 One thing that keeps fans coming back to see Dopapod is the high-level cohesion and skill. There's no hiding that these men are well-trained musicians and can just about do anything with their instruments, particularly the soloists of the four, guitarist Rob Compa and Eli Winderman on keys. Catchy yet complex guitar and keyboard riffs, well composed song structures, solid beats from Neal 'Fro' Evans(who recently returned to Dopapod on drums), and with funky low-ends like no other from Chuck Jones...we had to go back for more. Night two of the weekend was kicked off by Brooklyn based experimental duo, Paris Monster. Fans came to the venue early to check out the experimental multi-genre fusion music driven by crunchy analog bass tones, synth sequence arps, and Josh Dions’s soulful, whaling vocals. After Paris Monster got the blood flowing, more fans continued to pile in to the second night at the TLA for Dopapod. Philadelphia was the fourth stop on Dopapod's Spring Tour, spanning dates from now until festival season where they'll travel up and down the coast and through the Midwest joined by some friends on tour such as Aqueous, The Werks, and Hayley Jane and the Primates. The band started off the evening with a very special announcement that Rob and Eli had now been friends on Facebook for 9 years!! WOOOO! From there the band would kick off their set with a their funky organ driven, Moog lead-line riddled tune Bluetooth. The first set was cohesive with intricate jamming, and containing only seven songs in the setlist but packing in a whole lot of music in the meantime, featuring favorites such as Test of Time(TOT), Cloud World, and Onionhead. The break out of the set, which I feel many fans never thought they would see Dopapod play, was when they were joined by Paris Monster's Josh Dion for a spot-on rendition of the classic Rufus/Chaka Khan song, Tell Me Something Good, which was dedicated by Winderman to his girlfriend Allison. Set two of the second night took a drastic turn from the first set, boasting 13 transitions into different songs and featured a return to old favorites and more break out covers. The set would lead off with fan favorite Donkey Kong with Winderman playing the classic intro reminiscent of the original Atari game. The band touched on Black and White only to return to it 6 songs later with more fuerza. In the in-between we were treated to the band doing an instrument switch during the debut of Starfish, with Rob Compa on bass(the first time we've seen that) and with both Eli and Chuck on keys, followed by another break out cover with Dopapod absolutely nailing the Grateful Dead tune Crazy Fingers(Video below). This one would slow the mood momentarily while enthralling the fans with the band's ability to musically captivate you. Another song that made an appearance was the fairly new one, Please Halp. Toward the end of set two the band broke into another classic, Turning Knobs, before closing out with one of our favorites, Brain Dead. Dopapod has truly carved out a place for themselves over the past 10 years and continue to forge their way and solidify their future in the music scene. They are busier now then ever, at the beginning leg of a 26-show Spring run, getting booked at renowned venues and festivals, the recent release of their live album this weekend, and making major life changes all at the same time. If you didn’t get to catch the band in Philly, you can see them at their upcoming dates listed below including shows this week: 4/5 at Port City Music Hall in Portland, ME, 4/6 at Higher Ground in Burlington VT, or their 2 night run at The Paradise Rock Club in Boston on 4/7 and 4/8. Until next time friends, check out the photos and videos from the shows below and we'll see ya on the road!